Last night, in the center of the Turkish capital, a сar filled with explosives was detonated, which killed 37 people and injured another 125. According to preliminary information, a suicide bomber carried out the attack, but so far no organization has claimed responsibility for the act. Whilst the investigation is ongoing, social networks in Turkey are blocked, with the media being forbidden to give their version of events. The most likely authors of the terrorist attack are Islamic extremists and Kurdish radicals. It is doubtful that ISIS could have done it as usually they attack specific targets, such as tourist resorts with many foreigners. It is highly probable that this was done by Kurdish militants from the Kurdistan Workers' Party, as the day before the Turkish security forces carried out punitive actions in the eastern region, populated by Kurds, the result of which killed dozens of civilians. However, the Kurds often attacked military convoys and police. Another clandestine organization practicing violence is the Revolutionary People's Liberation Party–Front, who profess a Marxist ideology. It is also likely that the organizer of the attack may be the Turkish secret services, which need to justify further tough measures and the adoption of new laws. During the last ten years of Erdogan and Davutoglu's tenure, the security services and armed forces of Turkey have significantly weakened, with representatives of the secular political legacy of Kemal Ataturk being removed. As a result, persons associated with the sect of Fetullah Gullen and US agents replaced them. In addition, the migration crisis and the destructive position on the Syrian conflict have brought considerable damage to the Turkish people. It is obvious that the current government cannot cope with these problems, preferring instead to carry out repression against its own citizens. Because of this situation, the adequacy of NATO is put into question. Theoretically, the organization should deal with security issues in member countries, but regular attacks in Turkey show that the alliance is not concerned with these issues, and its leadership prefers to create mythical threats instead. From terrorist attacks to guerrillas? 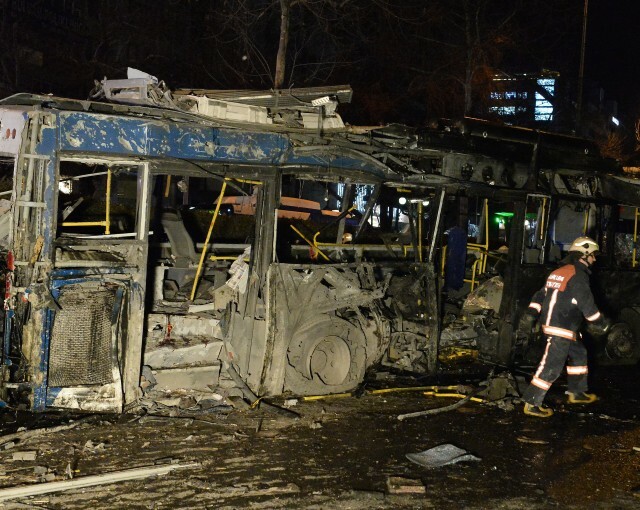 Ankara has become a frequent target for terrorist attacks, with the last explosion in the capital-taking place in February, and before that, in October 2015. The police is in a constant state of readiness, however, the effectiveness of the prevention of deaths of citizens is zero. It is interesting that on the 11th March, the US Embassy issued a warning to US citizens about the threat of a possible terrorist attack that may affect the buildings of the Turkish government. The current attack occurred not far from the office of the Prime Minister of Turkey.